Charlottesville, Va., Feb. 9, 2016 – From California to Ohio, Wyoming to North Carolina, St. Anne's-Belfield School teacher Victoria Redfearn Cave has crossed the country teaching professional development workshops to teachers. On campus, Redfearn Cave teaches PS/JK, fourth, and fifth grade music and movement as well as sixth, seventh, and eighth grade choir. She has trained in the Orff-Schulwerk approach both in the United States and in Europe, an approach which unifies music and movement seamlessly, and emphasizes student improvisation, composition, and process teaching. "The best part of preparing an Orff-based performance is not knowing the ending until you work with the children," says Redfearn Cave. "An Orff-Schulwerk practitioner does not treat students like artists-in-waiting. The adult is present to facilitate artistic conversations, to guide technique, and to help shape their dreams into reality. All the arts come together as one, creating a magical ending and perhaps a messy process." For Redfearn Cave, who graduated from Indiana University with a bachelor's degree in music education and from Mary Baldwin College with a master's degree in education leadership, continued professional development is valuable component of her career. 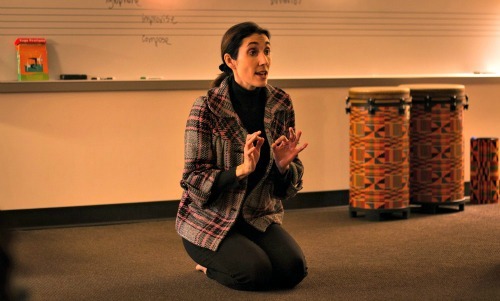 In addition to leading workshops for teachers and publishing in national journals including The Orff Echo, she is a faculty member at the George Mason University Orff training program and trains teachers through the Orff program at the University of Northern Colorado. "Ken Robinson, in his book The Element, talks about finding your tribe," notes Redfearn Cave. "I have found that for myself in teaching. Teachers are my heroes. It is one of the highlights of my life to meet so many educators and hear their stories. A workshop or training session can be just what a teacher needs to build community, reflect with a friend, examine their teaching practice, or feel valued." For more than 20 years Redfearn Cave has taught in independent schools in Washington, D.C. and Virginia, and has also served as the choral director at the Levine School of Music and the Kennedy Center's Washington National Opera. In addition to her work at St. Anne's-Belfield School, she is the artistic director for Mosaic Children's Choir. "I recently heard a quote comparing time management with energy management. It is important to be around people who energize you, and this saves you time," she explains. "For me, children energize me. I enjoy their humor, their optimism, and their complexities. " Redfearn Cave's latest publication, "The Catapult Dance: A Case Study in Student Self-Assessment," discusses the priorities of artistic experience and partnerships between students and teachers, which she illustrates through the example of "the catapult dance," created by fifth grade students at St. Anne's-Belfield School. It was published in the Winter 2016 issue of The Orff Echo.